Bridge Street Cottages are riverfront vacation rentals located at the edge of the charming village of Bigfork, near Flathead Lake and Glacier National Park. Surrounded by mountains and right on the banks of the Swan River, Bridge Street Cottages are the ideal vacation spot for golf, sailing, boating, skiing, rafting, fishing and hiking on the Swan River Nature Trail or in nearby Glacier National Park, Jewel Basin and the Flathead National Forest. Because Bridge Street Cottages are located in Bigfork, they put you within walking distance of the best restaurants, shops and art galleries in the Northwest. 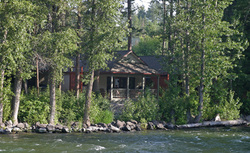 You will also be within walking distance of the Bigfork Summer Playhouse and near several golf courses. Bridge Street Cottages are the perfect cabin style resort accommodations. Completed in early 2004, they offer many luxury features such as full kitchens, fireplaces, washers and dryers, high speed internet, king size memory foam beds and deluxe sleeper sofas. Additionally, each cottage has its own personality which adds to the charm and character and makes each visit a memorable experience. Our partner, interior designer Sandra Othick, spent an entire year researching and planning our cottage interiors. She had each cottage finished to her specifications and furnished with hand picked furniture, fabrics and accessories of the highest quality. Bridge Street Cottages offers 6 one bedroom cottages, each with a king bed, 2 one bedroom cottages, each with two queen beds and 4 suites, each with a queen bed. Additionally, each cottage has a deluxe sleeper sofa or sleeper chair. With these different configurations, you can book anything from a single suite to a deluxe cottage right on the river. Directions: From Glacier International Airport turn right onto Highway 2 and continue to Highway 35. Turn left on Highway 35 and continue to Bigfork. When you get to our one stoplight at the intersection of Highway 35 and Grand Avenue turn left and drive into town. You will see the bay on your right and a few seconds later you will come to Electric Avenue. Turn right, follow Electric Avenue through town. Electric Avenue turns into Bridge Street. We are on the left hand side just before you cross the Old Steel Bridge.